This exclusive event is a MUST for any Boxing fan. 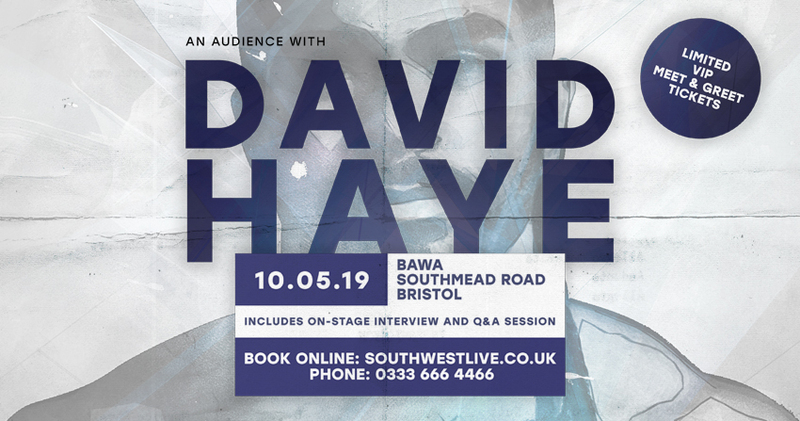 Your chance to spend an evening in the company of DAVID HAYE at BAWA, Bristol. David will be interviewed on stage and will also take questions from the audience. Seating in the front 6 rows ensuring a fantastic view. Seating in the front 2 rows ensuring the very best view. Exclusive access to VIP area (just 60 platinum tickets available) where you’ll mingle with David for 45 mins before the event starts, enjoy 2 complimentary drinks, Professional photo with David & autographed souvenir photo. David Haye is a British former professional boxer who competed from 2002 to 2018. He held multiple world championships in two weight classes, and was the first British boxer to reach the final of the World Amateur Boxing Championships, where he won a silver medal in 2001. As a professional, Haye became a unified cruiserweight world champion in 2008, winning three of the four major world titles, as well as the Ring magazine and lineal titles. In the same year he moved up to heavyweight, winning the WBA title in 2009 after defeating Nikolai Valuev, who had a size advantage of approximately 9 inches (23 cm) in height and 99 pounds (45 kg) in weight over Haye. Along with Evander Holyfield, Haye is one of only two boxers in history to have unified the cruiserweight world titles and become a world heavyweight champion.